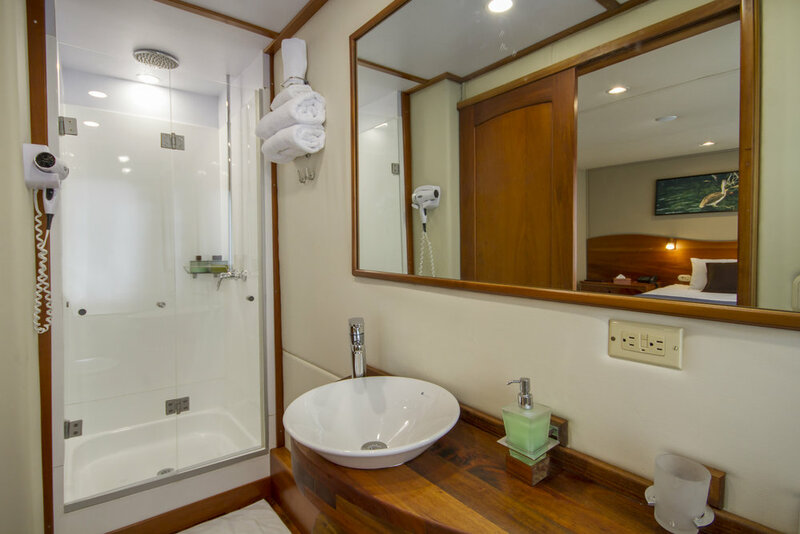 A Standard Queen Stateroom aboard INTEGRITY is generously proportioned, located on the main deck with en suite facilities, large walk-in rain shower and individual climate controls. This generously proportioned stateroom (#9) measures 150 ft² with individual climate controls and large en suite facilities with walk-in shower. Located on the main deck, large picture windows feature the beauty of the Galapagos and plenty of natural light. There are two reading lights, ample electrical outlets to charge your devices and and entertainment center with flat-screen TV. Entertainment center with TV, DVD player and ipod dock.